On the UC Berkeley campus, pedestrians have the right-of-way at all times, except where signage directs pedestrians to give the right of way to bikes. Bicyclists are subject to the same rules of the road as motor vehicle drivers. There are even speed limits for bikes. Within 10 feet of a pedestrian, you can be fined for going faster than 5 mph. The maximum speed limit on roadways is 25 mph, except where posted otherwise. In driveways and parking lots it is 10 mph. Basically, where there are crowds of people, that is probably not the time to ride. Don't get caught in The Walk Zone (the time and place), or you might get a citation. If you are cited for a "Walk Zone" violation, you may reduce the fee to $50 by attending a 2 hour BEST class. if you decide not to attend the BEST class, citations will be submitted to the Clerk of the Court for normal processing. Classes are administered by Bike East Bay. You cannot ride a bicycle while wearing headphones. You must have a headlight that illuminates the path when riding at night. A headlight for night riding use is required by law. A red rear reflector, two side reflectors on each wheel and reflector pedals should be used. Light-colored, reflective clothing is also a good idea. Signal your turns and moves. In general, be visible, ride predictably, and communicate with motorists by your actions and signals. EXTRA CREDIT: To avoid unpredictable collisions, it's nice to let pedestrians know you're approaching and which side you'll pass them on: i.e. call out a hearty, "On your left!" so that you're sure you are heard. Read more guidelines in Share the Road. Where can I park and lock my bicycle? Ask yourself, "If I lock it here, would it block passage or access to someone requiring use of a handrail, or the full width of a throughway." Fines and parking tickets can exceed $200. Don't park carelessly or your bike may be impounded. What about motorized bicycles, scooters, and motor-driven cycles? UC Berkeley's Annual Security Report — Contains three years of theft statistics for various areas on campus. UC Berkeley Parking & Transportation Department, Bike Info page— Offers extensive information about bicycling in the area and about equipment and safety. 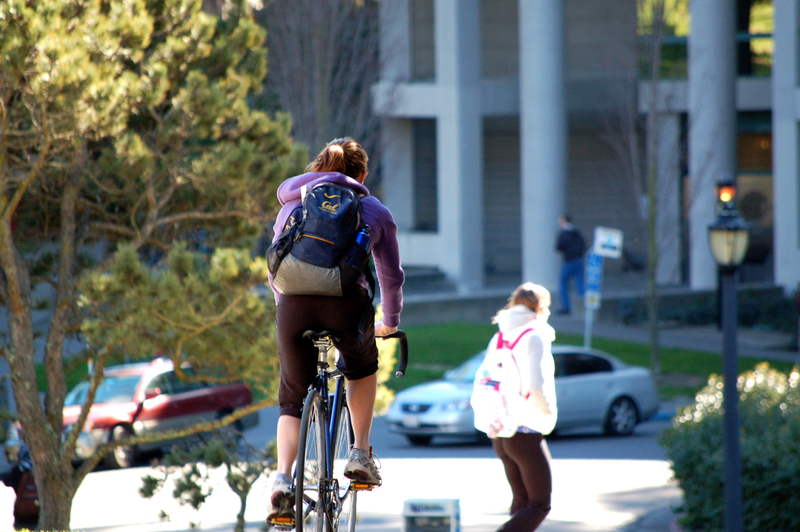 P&T has worked with the campus to develop the Campus Bicycle Plan. 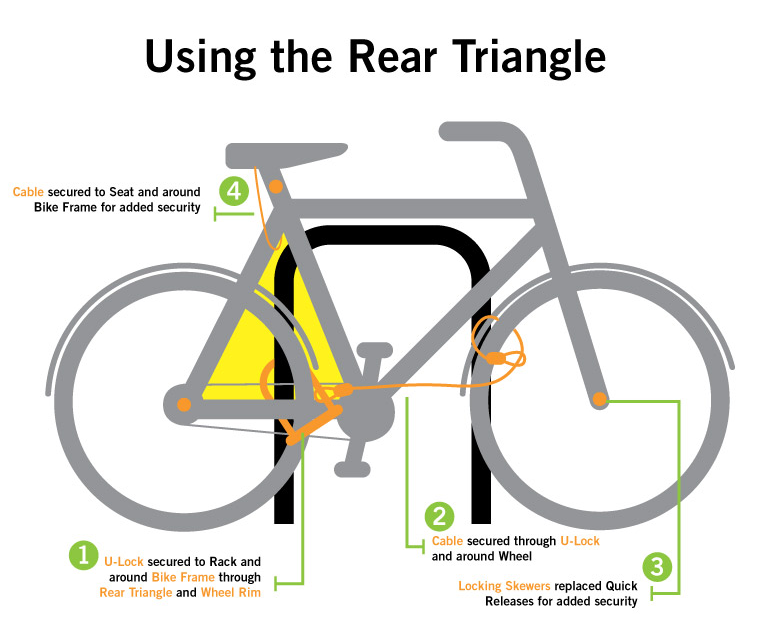 San Francisco Bicycle Coalition, Locking Page — This page details the best bike locking strategies. Learn about being on campus on a bike. Use a U-lock and a cable to hold all pieces of the bike securely to the bike rack.